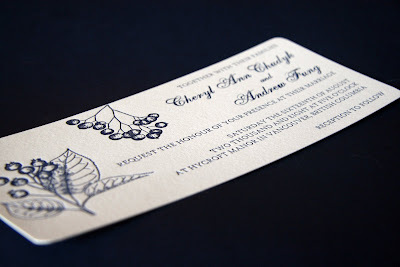 A couple months ago, Cheryl approached me to letterpress her wedding invitations that she drew and designed herself. There were several unique features in this project. 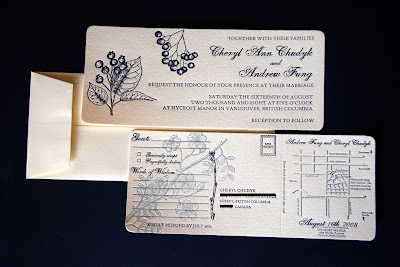 First, Cheryl wanted to get open-end envelopes for her letterpress wedding invitations. As luck would have it, my friendly neighborhood paper supplier had just begun stocking open-end Crane's Lettra envelopes. 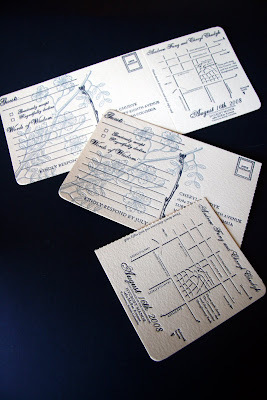 Second, she wanted the invitation and the enclosure card to both be #10 sized, and she wanted guests to be able to perforate part of the enclosure off to use as a reply postcard. And of course, all the corners were rounded by yours truly. 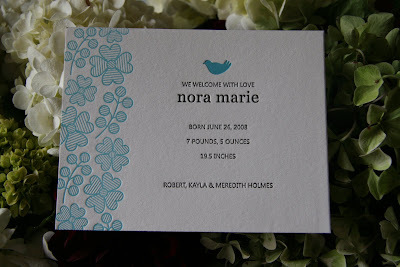 The result is gorgeously textured with a deep blueberry blue color atop the ecru colored cardstock. I also love that the enclosure card perforates and guests keep a part of the enclosure as the map. 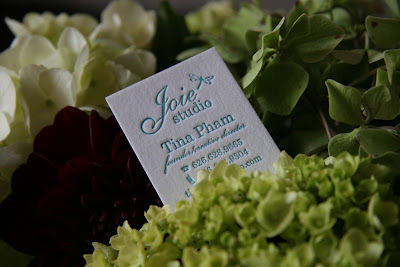 With floral centerpieces in the studio, I decided to use it as props for some of our past projects. From top to bottom, it's my own business card, a letterpress baby announcement card, and LUXE letterpress' Siena letterpress invitation. You know, I grumble about going to Beverly Hills mostly because there's no real easy way of getting from Pasadena to Beverly Hills. Today I made the trek to a networking event at Greystone Mansion in Beverly Hills, and it was a trip well worth it. It is one of the most beautiful venues that I have been to in the greater Los Angeles area in a long time. And, I have to be honest, driving down Sunset Boulevard on my way home did make me feel just a tad bit more cool and chic and Hollywood. 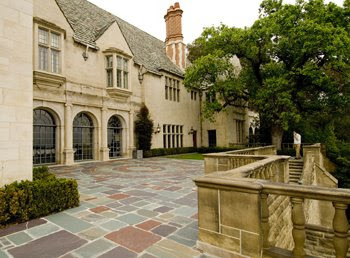 The photos of Greystone Mansion are from the city of Beverly Hills, and they do not do the Mansion justice. I should have brought my camera. I really should have, because the venue was absolutely amazing with its panoramic views of Los Angeles, gorgeous exteriors, and beautiful English gardens. It felt like I walked into a fairy tale castle. And that's really saying something considering how many European castles and palaces I've been to! The best part is that when there's not a wedding, it's a park, and the grounds and the exteriors of the mansion are free for everyone and anyone to enjoy! I'm going to share more as soon as I decompress a bit from the excitement of meeting new people and making new wedding contacts. Remember that gorgeous photo of Megan's invitation that I posted awhile back? I've been working on contacting my past clients and their wedding photographers to help out with this new project of mine called "A Letterpress Wedding." 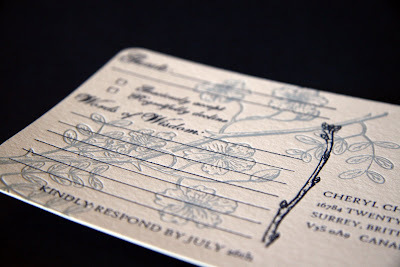 As this blog site is about all the goings-on at Joie Studio, I wanted there to be a blog site that was more of a showcase of actual letterpress invitations and the weddings that they were designed for. 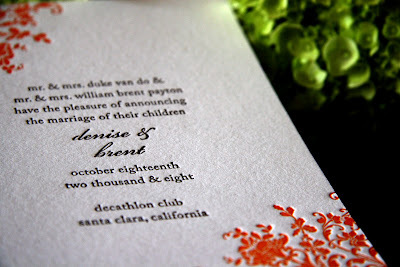 When I was planning my wedding, I got so much inspiration from looking at other people's weddings that I hope "A Letterpress Wedding" is a resource for people getting married, showcasing great designs, beautiful color schemes, and gorgeous photography. Let me know what you think! 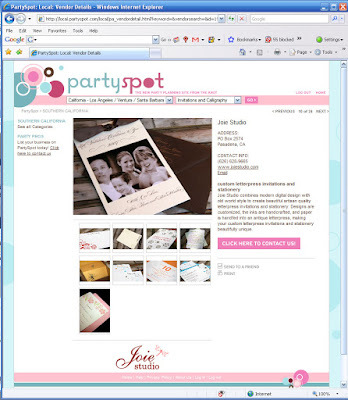 For the last year, Joie Studio has been operating almost exclusively on word of mouth advertising. We've had great support from some really rocking design blogs like hapa hale, Paper Crave, and Poppytalk, which has been great for business, and our clients have been so happy with us that we've gotten some really great referrals for new clients. But, you know, at some point, word of mouth can only go so far. 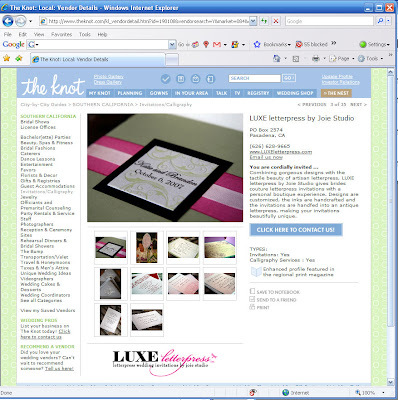 So Joie Studio is now listed on The Knot, The Wedding Channel, and Partyspot! 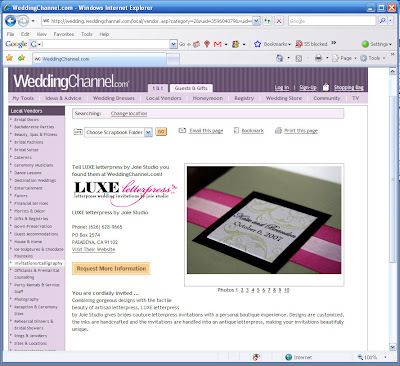 I absolutely love how The Wedding Channel ad is set up especially as the LUXE letterpress logo is on top. I'm excited to join The Knot community, too! I know when I getting married, The Wedding Channel and The Knot were wonderful resources, and I'm excited that Joie Studio is a part of that!